In addition to creating platforms for more for accessible information, framing the story in a context that stakeholders can relate to is key. Kazemi said that the environmental message isn’t always effective and that “being heavy handed with guilt and fear and shame doesn’t work.” Yancey warned against a “saving the polar bears” message for tenants, and suggested a focus on benefits such as comfort and well-being. 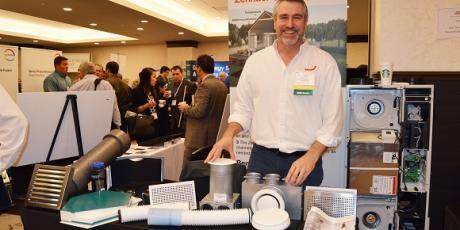 Phil Madnick, Program Manager at Con Edison’s Multifamily Energy Efficiency program, cautioned against “go[ing] in there and talk[ing] about climate change” with building managers, who are more interested in the bottom lin. Loic Chappoz, Project Manager at NYSERDA, believes that property owner-managers will “respond to a good business case.” And Kazemi stressed the importance of making “wonky academic speak accessible” to all stakeholders. For consumer-facing messages, visual images are just as important as language, and the medium is often the message. Spiegel-Feld suggested adopting the real estate advertising requirement used in Denmark. In addition to the usual photo, building type, square footage, and number of rooms, ads, which are laid out in a consistent format, must include an energy score. While Denmark has required energy benchmarking since 1997, meaningful change only began to occur after July 2010, when the advertising requirement kicked in. Before that date, properties with high energy grades sold for 2.4 per cent above low-rated properties, but once the grades were added to the advertisements, properties with high grades sold for an average of 10.1 per cent more. Another consumer-focused approach, which is used in Spain, is to place labels on buildings that are much like those we see on restaurant fronts in New York City. These use a color-coded bars indicating energy efficiency ratings ranging from A through G, which transition from green to yellow to red, as the rating gets worse. GreeNYC has already seen success with its Small Steps, Big Strides campaign, which engages consumers in actions to reduce energy use, eliminate waste, and choose a more sustainable lifestyle. Ads featuring the friendly Birdie mascot appear on transit and bus shelter ads; Birdie can also be found on the GreeNYC website, Twitter, Facebook and Instagram. The City’s program offers specific actions New Yorkers can take at home, at work, and on the go, and includes a BYO pledge program that rewards reusable bottle users with a free reusable bottle, mug, or bag, each of which has a picture Birdie printed on it.